Okay, I admit it. I just haven't been in a mood to blog lately. That's not to say I don't have anything I want to blog about because I do. 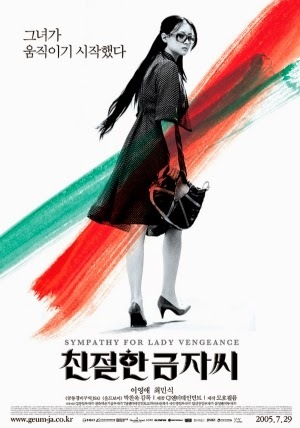 I recently came off a rather impressive movie binge and finished up another anime series so I've got a batch of reviews I'd like to get around to and to kick things off I'd like to dissect Sympathy for Lady Vengeance, the finale in director Park Chan-wook's Vengeance Trilogy. One thing I really liked about this movie was how Park Chan-wook brought back almost everybody from his prior installments in the Vengeance Trilogy. The most notable star returning is Choi Min-sik, who had portrayed the hero in Park Chan-wook's Oldboy (as well as the detestable villain in Kim Ji-woon's I Saw the Devil). Min-sik is probably my second favorite Korean actor (next to Lee Byung-hun), but here he isn't the main focus of the attention. Although he is certainly fascinating with what screen time he is given and I can guarantee that you won't like his character at all. Kang Song-ho, Shin Ha-kyun, Yu Ji-tae, and Yoon Jin-seo also return from previous entries in the Vengeance Trilogy for cameo roles. Lee Yeong-ae's character Lee Geum-ja is the focus of this movie, though. She plays a woman who is released after being in prison for thirteen years. The reason she went to prison was because she was accused of killing a young schoolboy named Won-mo. She even confessed to the murder even though something always seemed off about her description of certain events. There's a reason for that, though. After being released from prison Geum-ja takes it upon herself to hunt down the real killer of Won-mo, Baek Han-sang (Choi Min-sik). But why did she choose a decade in prison over turning Baek Han-sang in to the police? Well, that's one of the reasons why you have to watch this film. The final hour alone is also worth watching this movie. What happens in the final hour? Well, it's one of those things you just have to watch to believe. It certainly makes this movie more than worthy of being the finale of this Vengeance Trilogy. This isn't just revenge, but epic revenge. Lady Vengeance was definitely stylish in ways that Sympathy for Mr. Vengeance wasn't while not being quite as over-the-top (for the most part) as Oldboy. It is primarily told in chronological order but with plenty of flashbacks to her time in prison in order to help fill in the gaps of the story. You'll definitely feel for Geum-ja's character even though you'll realize that she has her flaws, too. You could even say that she was just as guilty of putting Won-mo and herself in that position as was Han-sang. But you'll root for Geum-ja anyway because she got the short-end of the stick compared to Han-sang. All in all, I am very impressed with Park Chan-wook's Vengeance Trilogy and I highly recommend all of them. It doesn't matter if you watch them in order or not, but only that you do watch them. I really don't have any complaints about this movie, but if I were to try to make one then it would probably be something like "Choi Min-sik needed more screen time." That's just me and my respect for Min-sik's considerable screen presence seeping through, though. P.S. - Choi Min-sik made his English movie debut in Luc Besson's new film Lucy. Now I've got to see that one.